“The other side of the pillow, folks. Because it’s flat when you’re sagging, fresh when you’re stale, and cold when you’re hot, baby. In the high heat of a summer, even with air conditioning, the cool side of the pillow can be really awesome, but only if it’s a good pillow with a crisp cover on it. And this just neatly segues into this week’s episode. 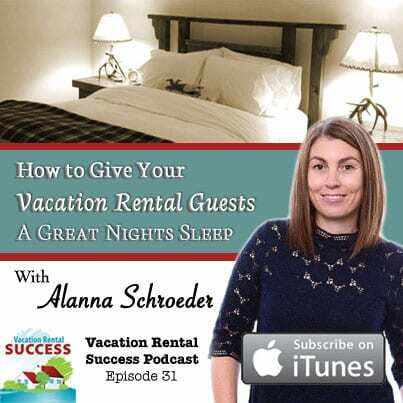 We can’t control every aspect of our guests’ sleep experience when they stay at our vacation homes, but we can contribute a lot to making their slumber the best ever. Good beds; bedside lighting that makes it easy to read, yet not too bright to disturb a bed partner; the best linens and of course, cool pillowcases. Alanna Schroeder is my go-to person for anything to do with bed linens, towels and amenities, and judging by the amount of discussions on forums related to the topic, it’s a hot one for many owners. On her site, The Distinguished Guest, Alanna sells a range of sheets, duvet covers, towels and amenity kits and has a great blog that covers topics related to linens, bedding as well as general rental issues. She also owns two vacation rental properties so definitely walks the talk! Leave a comment and tell us about your beds. What is your criteria for choosing bed linens? What works best? What doesn’t work as well? Let us know what your thoughts are on this subject. (either 100% cottage or a 60/40 polyester cotton blend). We’ll make the draw on July 15th so make sure you get your comment posted before then. In addition Alanna is offering a discount code for anyone buying sheets from The Distinguished Guest for the month of July for North American buyers. I really appreciated this podcast and learned a lot. I have been buying sheets from livingsocial and groupon, and just could not understand why these ‘expensive’ sheet sets were so thin! Thanks for the education, and I’m looking forward to trying your sheets. The question for me, is always how much to spend on supplies, and where is a good place to cut costs, but still offer quality. I thought for sure that the higher the thread count the better the sheets. So I was nodding my head when I heard the podcast when Alanna saying that is not always the case. I found some 400 thread count sheets that were super cheap and now I know why! I can assure you that any future purchases for bed linens for our cottages will be from the Distinguished Guest. I can tell by listening to her speak that she takes pride in her sheets and wants her guests to have a comfortable nights stay and that is exactly how I want my guests to feel. Great guest and great podcast! Great discussion about beds and sheets. We have not found the silent waterproof mattress pads. It is so important to routinely sort through and check linens to retire all the worn linens and keep the collection clean and crisp. I have all Alanna’s sheet sets and use them every day and love them! From her basic products to her more luxurious, I can’t say enough good things about them. Loved the podcast!